Triaenodon obsesus has a slender light or dark grey body with a white underside. They have white tips on the first dorsal fin and upper tail lobe. Occasionally with spots on the side. The snout is rounded. They live solitary or in small groups and are usually seen lying on the bottom. “Near threatened” according to the IUCN Red list. 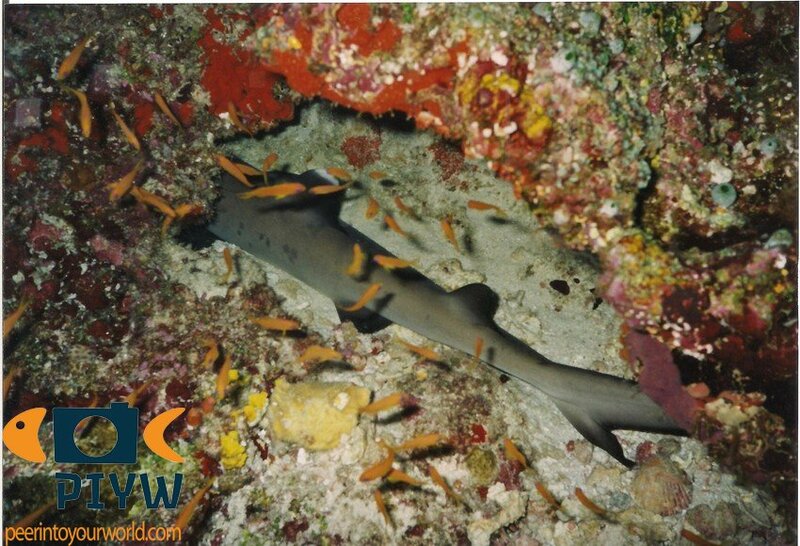 The whitetip reef shark has a widespread distribution in tropical and subtropical Indian and Pacific Oceans. Although this shark species is often seen by divers and is abundant over coral reefs, these sharks’ numbers are at lower levels than those found prior to widespread expansion of fishing in the past 20 years. The species’ restricted habitat, depth range, small litter size and moderately late age at maturity suggest that with increasing fishing pressure this species may become threatened. Ind0-Pacific. Red Sea and East Africa to Indonesia, north to Ryukyu and Ogasawara islands, south to New South Wales (Australia), New Caledonia, and the Austral and Pitcairn islands; throughout Micronesia. Eastern Pacific: Cocos and Galapagos islands, Panama to Costa Rica. They are often found resting on the bottom or in caves and ledges of seaward lagoons and outer reef slopes. They are also found on sand patches and current channels in a depth range of 3-125 meters. Viviparous breeding (they give birth to living young), with 1 to 5 young per litter. Each litter usually yields 2 or 3 pups after a gestation period of 5 months. Size of the pups at birth 52-60cm. During courtship and prior to copulation, the male bites the female on her right pectoral fin and uses his medially flexed right clasper in copulation. During copulation which lasts from 15 seconds to 4 minutes, both heads of the male and female are slammed in the substrate and their bodies undulate to keep their tails elevated. Triaenodon obsesus feed at night and sometimes in large numbers together. They feed on fish, octopus, and larger crustaceans, such as crabs and lobster. 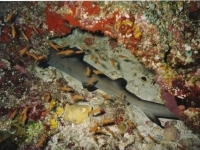 Whitetip reef sharks are fished commercially and their meat and liver are used for human consumption. Whitetip reef sharks are rarely involved in human attacks, but extra caution is advised during fish spearing. Reef sharks need current to get oxygenated water through their gills, so you will find them on current-prone reefs, often with a lot of relief changes, such as reef pillar, caves, crevices and so on.